Rest assured. Our CBD oil is legally imported and sold in Japan. It is made from organically grown industrial hemp and CO2 extracted without the use of alcohol or any harmful solvents. All of our products are laboratory-tested, certified and guaranteed to contain everything presented on the label. Each product we offer is a wholesome extract, not synthetic and not an isolate. It contains all the synergistic Cannabinoids, Terpenoids, Essential Oils and other compounds of the original plant. Elixinol 300mg CBD oil is our best selling product. It comes in a 30ml bottle and contains 5 mg of CBD per suggested serving. This product has a 1% CBD concentration. It comes in two flavors; cinnamint and natural. Suggested Serving Size: 1/2 dropper (0.5ml) taken under the tongue three times daily which will provide many valuable nutrients including 15 mg of CBD. Elixinol 1000mg CBD oil is a larger bottle of our best selling product, providing a better value per milliliter. It comes in a 100ml bottle and contains 5 mg of CBD per suggested serving. This product has a 1% CBD concentration. Suggested Serving Size: 1/4 dropper (0.5ml) taken under the tongue three times daily which will provide many valuable nutrients including 15 mg of CBD. Elixinol 3000mg CBD oil is a higher concentration formula providing the best value per milligram of CBD. It comes in a 100 ml bottle and contains 15 mg of CBD per suggested serving. This product has a 3% CBD concentration. Suggested Serving Size: 1/4 dropper (0.5ml) taken under the tongue three times daily which will provide many valuable nutrients including 45 mg of CBD. Elixinol Black Label 4% CBD Oil is pure hemp extract. It contains 1200mg of CBD in a 30ml bottle. This product has 4% CBD concentration. This is the highest available concentration and the flagship product in the Elixinol CBD oil line up. It is not diluted with MCT oil. It has strong earthy taste. Available exclusively on the HealthyTOKYO shop. Suggested Serving Size: 1/4 dropper (0.5ml) taken under the tongue three times daily which will provide many valuable nutrients including 60 mg of CBD. The Hemp used is in Elixinol CBD Vape Oil is grown organically, and CO2 extracted. The resultant oil is then added to an easy-to-use 15ml bottle, containing 300mg CBD (cannabidiol). It is a wholesome extract, not synthetic and not an isolate. It contains all the synergistic Cannabinoids, Terpenoids, Essential Oils and other compounds of the original plant. Furthermore it contains no harmful ingredients commonly found in other vaping tinctures such as PG (propylene glycol) and PEG (polythylene glycol), instead Elixinol CBD Vape Oil uses a Kosher VG (vegetable glycerin)-based solution which has been shown to produce more vapor than PG and PEG based solutions as well as it not know to cause allergic reactions or irritations frequent with PG based solutions. These flavorless vegan capsules makes it convenient and easier than ever to take CBD. Elixinol CBD capsules contain all the healthy synergistic cannabinoids, terpenoids, essential oils and other compounds found in the original plant. Including Omega 3-6-9, that works well in conjunction with CBD. Suggested Serving Size: A 60-capsule container of Elixinol CBD Capsules contains a total of 300mg of CBD. The suggested serving is one or two CBD capsules daily which will provide many valuable nutrients and cannabinoids, including 5-10mg of CBD. CBD Rescue Roll-on comes is a pack of 2 filled with jojoba essential oil, peppermint essential oil and cannabidiol giving a refreshing feeling when applied to the skin. Can be applied to inflamed skin, such as sunburned areas. Can also be used on inflamed or stiff joints and muscles. Other areas it can be applied to; the neck, temple, shoulder and wrist etc. Can I pay in cash and pick up the CBD oil in your office? Due to popular demand we now store a small supply in our office to allow you to buy directly. Our office is a short 5 minute walk from Roppongi Midtown. Click here for directions. Pick up is available on weekdays between 10:00 – 17:00. We appreciate advance notice by email or phone (03-4405-6202) and exact change. Will my order get stuck in customs? No, our inventory is stored in Japan for quick and convenient domestic shipping. Is CBD Hemp Oil legal in Japan? Yes, this product contains 0% THC and we are happy to be able to legally offer this product since November 2016. Is Elixinol CBD Hemp Oil of high quality? 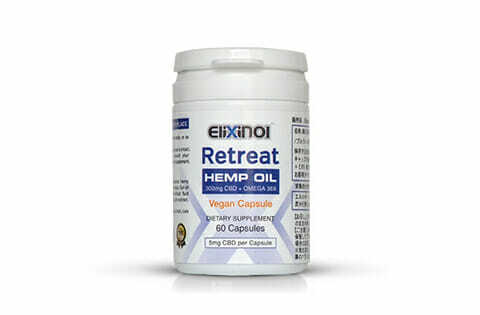 Yes, rest assured that Elixinol CBD Hemp Oil is of the highest quality. While it has been brought to our attention that some brands of CBD oil circulating does not contain what is being advertised, we can share lab results that shows exactly what is in your bottle. Click here to download Certificate of Analysis and for any questions, feel free to contact us at shop@healthytokyo.com.